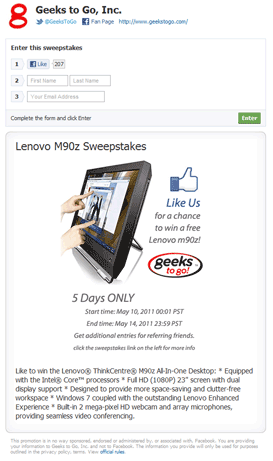 Thanks to our friends at Lenovo, we're giving away an M90z All-in-One multi-touch computer. This powerful, versatile PC would be at home in a classroom, on a workstation, or on your desktop. The All-in-One design eliminates most cables and clutter. Powered by a 3.2GHz Intel Core i5 CPU, 4GB DDR3 RAM, Windows 7 Pro (64-bit), and a 500GB hard drive. It also features a huge 23" multi-touch screen. Read our full review. "Like" Geeks to Go on Facebook, enter your name and email address to enter. Share w/friends, get an extra entry for every Facebook friend to enter! The contest is for 5 days only. May 10th through May 14th 2011! Your email address will never be used for marketing, and will never be shared.